Abby over at Scrapbookaholic and her BFF are doing there very first blog hop for the Day of the Dead (Spanish: Dia de los Muertos). Click on the button for more information. She also has some blog candy going on for those that will help spread the word (click here for details). You won't want to miss out on this!!!! Over at Polka Doodles they have a challenge going on right now. The challenge is to create something that has a hidden element. Here's my take on the challenge. I used Paper Doll Dress Up for the little bat. I used a Cricut marker to trace it, then cut the bat out. The letters are actually cut outs I had that matched perfectly. The patterned paper is some of the beautiful paper I won from Serenity Scrappers. Isn't it the cutest paper ever?!!!!!! Thanks for stopping by!! Paula at More Than Favors has a challenge going right now. The challenge is to use Pink, Black, Gray, and White. As I was thinking about what type of card to make, I found out that one my friends lost her Father-in-law. I wanted to make a card for her and this is what came to mind. I used Gypsy Wanderings for the branch and pink flowers. The white parts of the flowers are just some white Prima flowers I had. I'm not sure where the stamp is from (sorry)!! Kassidy over at Inking it Up Crazy is having a challenge. The challenge is to use a cartridge that you don't normally use. Well, the only one that I could really think of was Accent Essentials. I decided to make this card. I know, last minute!!! I meant to get this done last night, but that didn't work. Emma over at My Creative Time has a challenge (that ends today) to go back to the 'Old School' way of making cards. The challenge is to make a card without any big fancy machines, going back to basics. Well, here's my take on it. I know of several people that are really close to having a baby so I thought this would be perfect!! The paper is from a pack I found at Big Lots so I don't know what brand of paper it is. I used a border punch to make the little corners and the sticker is from Marcella by K. I love the sticker and the paper because they're so sparkly! :) Thanks for stopping by!!! I love to visit Abby over at Scrapbookaholic! She is super creative and I love all of her projects. She just posted yesterday that she would give this card to someone that commented on it (click here to see it), and I won!!! I can't believe it!! It's such a cute card, I feel so special. Thanks so much Abby!!! For those that know a little about me you know that anytime I make a card for a family member I always have my children help with ideas (makes it more personal). So, for my Mom's Birthday I asked the kids what they love best about Grandma. The first response was going to feed the horses (they say this for just about anyone in my family), the second thing was that they love when she takes them swimming. So, this is what I came up with. For this card I just used the Paper Doll Dress Up cartridge, and the stamp is one of those dollar stamps I found a long time ago. Guest Designer cont . . . I hope you stopped over to visit Georgiana at Carson's Cricut Creations!!! She let me visit her blog to do a guest post (SO MUCH FUN!!!) Here's the end result, make sure you go see her to get all of my directions! She's also having a birthday giveaway of a surprise cartridge!! Hurry over and wish her a Happy Birthday!!!!!! This one is one of my favorites I've made so far! You'll have to visit Carson's Cricut Creations to hear the story and to get directions!!! Thanks for stopping by!! 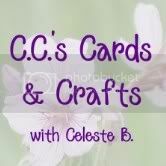 I had the wonderful opportunity to be a guest designer over at Carson's Cricut Creations! You'll have to stop by, say hi, enter her Birthday Giveaway, and see all of the amazing things she's created!!! Here's a little sneak peak . . . Enjoy!! Wow, it's been crazy at my house; it seemed like it was one thing after another. Well, I've been working on this project for a while now (I know - terrible)!! My oldest just started kindergarten and LOVES it!! Between riding the bus, meeting new people and learning new things she couldn't be happier!! I made this little gift for her teacher. I used a recipe box I got on sale to hold the cards (looking back I wished I would have decorated the box . . . oh well). For the cards I just printed off the sentiment on a few sheets of beautiful cardstock that I have. I made it so that I could cut 8 cards out of one sheet of paper. I cut out a few apples from the Preserves cartridge and used some stamps I had for the rest of them. I thought the teacher might like a little bit of variety. I also made the teacher a quick card with this little poem I thought of. I was over at Made by Momo looking at the challenge that she has going on right now. Momo's challenge was to make a card 'just because'. The first thing that came to my mind was to send a card to my Grandpa and Grandma. I decided that I wanted to let them know how grateful I am to have them in my life; I love being the oldest (and I think favorite) grandchild. My Grandparents' house is surrounded by trees, and this time of year the leaves on all of the trees would be changing; I always loved the colors!!!! While creating this card I found Card Creations & More by C; she has a challenge going on right now. Her challenge is to use ribbon and bling. PERFECT!!!!! 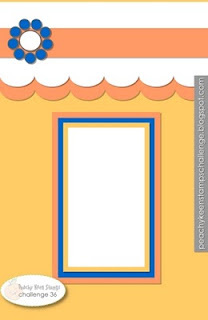 A few days ago I found a cute little blog called Paper Playtime. The have a challenge for anyone that would like to participate. They based the challenge on the phrase 'If the shoe fits, buy one of every color'; so the challenge is to make something with either a shoe or variety. Before the project was completed I knew it was missing something, but I wasn't sure what. Well I started looking through blog-land and found Practical Scrappers. They have a challenge to use buttons. Well, searched through my buttons and found the perfect one. The picture doesn't quite do it justice - it's a very rustic looking button. I put some string through it to give it a little pop. Here's a close-up of the phrase. I printed the phrase off on my computer. As well as a close up of the button. The boot is from Old West. I just used a scrapbook pen to trace the cuts (since I don't own a Cri-kit Pen). The background paper is from a stack I found at Tuesday Morning's, the dark blue has the flocking on it. Thanks for stopping by!!! This time of year is big for me and my hubby and our children, HUNTING SEASON. Even though our little ones are still very little we include them in on everything we do. I know, some people don't like it or may look down on it; but it is a time for us to be together and enjoy the outdoors as a family. I also like it because we're able to put meat in our freezer. So I thought I would make a card for our hunting season. The card also has a second use - I forgot about Grandparent's Day (OOPS!!) so I made this one for my in-laws. We go hunting with them, so I thought they might like it (that's where the 'oh deer' comes in). Disclaimer - This is one of her cards; I did not create it, Georgiana did!! SHHHH - don't tell the hubby! I couldn't believe the deals! I wish we could have looked around a little more, but the little man was hungry so we kept it short. :) Thanks for stopping by!!! I think I like the one on the right better (layout wise), it seemed a little cuter to me. I used Gypsy Wanderings for all of the cuts. The patterned paper is from a stack I found at Big Lots a long time ago. Thanks so much for stopping by!! Well, a few posts back you'll see that I was fortunate enough to win the October 31 solutions cart from Rosy at Sweet Delights Paper and More. Well, I LOVE this cart!!! It's perfect (for those that Love Halloween). Stephanie over at Always Crafting is having a challenge to create something with the Mini Monsters cartridge, if you have it; if you don't own it (like me) you can make something Halloween or Fall - ish. :) YEAH!!!! An . . . excuse . . . to use my October 31 cartridge (Yeah - I'll find any excuse)! I thought I might try one of those gate cards that everyone has been doing - I know, I'm always the last to the party. :) So without further ado - here's my creation. The patterned paper is from Stampin' Up. I'm not sure if they still have it or not - a wonderful friend of mine is a demonstrator and she gave me a bunch of scraps (YEAH!) and some of the old paper that is going out. :) Of course for the window I used the October 31st cart and the cute little ghosts are from Paper Doll Dress Up. I cut the ghosts out in a velum type paper so that they seem a little see-through. I traced their eyes and mouth with a fine tipped pen, since I don't own any of those cri-kit pens yet. :) Thanks so much for stopping by!!! I won and forgot to share! I feel terrible!!!! A few posts ago I posted a two page scrapbook page of 'My Little Pumpkins' for Serenity Scrappers Blog challenge. Well, I forgot to post that I won!! They are so awesome!!! There were three of us that went in on the challenge and they decided to let all of us win!!! I'm so excited!!!! Thanks so much Serenity Scrappers!!!! GRRRRR - is all I can say to my final result! Don't get me wrong - I loved the challenge over at Peachy Keen Stamps! They challenged to use the color scheme and sketch below. I was trying to make this really cute (yet masculine), but had a few problems along the way. Long story short - It worked, but not as planned; I ended up having to write the sentiment (that's where the GRRRR comes in). My Dear Father-In-Law's Birthday is right around the corner. One of the things my kids love to do with Grandpa is go fishing so this was the card we came up with. I used the sketch and colors from Peachy Keen Stamps Challenge, but I flipped it upside down to fit. Like I said - not the way I wanted it to look, but it will mean a lot to him because it's from his grandkids. I did end up doodling a little before we sent it - forgetful me forgot to take another picture, sorry! I used the Camp Out cart for the fishing pole, the fish is from Paper Doll Dress Up, and the waves are from Plantin Schoolbook. Pay no attention to the terrible inking job, it's a skill I still don't have mastered. :) Thanks so much for stopping by!!! The font used for the layout is from the Mickey Font and the pumpkins where cut from Gypsy Wanderings. I had a question on how to do the Xyron technique with glitter like I did in my last post and the dress in the card below. So really quick (with pics since I don't have a camera) I'll go through how easy it is. I own both a 1.5" Xyron as well as a 5" one (they were on sale so I figured why not). For this one I used my little Xyron. You place the item that you would like to glitter into the machine (if it's called that). Make sure your item is face down. After it goes through and you've torn it off I like to press it down with a boning tool or a credit card to make sure none of the sticky comes off of it. Make sure you go around the edges too! You can see the back side of the sticker below and you might notice the lines where I went over it (I still needed to do a little more). After you've gone over it you can separate the backing from the front part and you'll have your sticky image. Oh, a little shiny. :) Obviously I didn't go over the top of the dress to well, you can see the little bit of bubbling. One of the best things I've found was Glossy Accents. I purchased this at Roberts (when I lived in Utah), but I'm sure you can find it at any craft store - and I know you can find it online. I love this because you put it over the glittered image and it makes it stand out a little, but it dries clear so you can see the glitter without the mess! (YEAH - no glitter in the bottom of an envelope.) Below you'll see it right after I put it on the dress. After the Glossy Accents dries you can place the image on your card. TA-DA!!!!! This little card was made using the equipment above, but I also used Gypsy Wanderings for the dress and Ashlyn's Alphabet for the frame. The sentiment was a stamp I got a long time ago (sorry - I didn't keep track of names), and the bling is from Basic Grey. This card is going to my little sister. She recently made a decision to go on a mission for my church (The Church of Jesus Christ of Latter Day Saints). She will be leaving in November and I can't even tell you how proud I am to be her older sister!!!!!!!! I really wanted to make something special for her, so this was perfect. Love you Stevie!!! Long story short - I was trying to create a cute card for a lady in my church group. I was blog surfing (like I always do when in need of inspiration) and I two awesome blogs had different challenges. Made by Momo challenged everyone to use black, white and only one other color; that got my brain going. 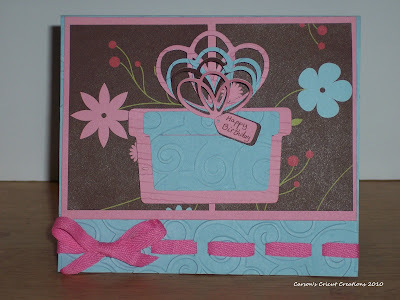 Then I went to another fav - Cricut Cardz Challenge blog. They are challenging everyone to use a scalloped shape. After those two, this is what I came up with; I hope my friend likes it.